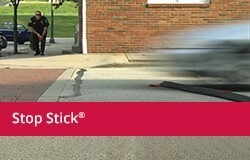 While the Stop Stick® Tire Deflation Device has effectively and safely assisted in the termination of thousands of pursuits, it's rare when the device is able to stop two suspect vehicles with one deployment, but that's exactly what happened to Officer Mike Fisher of the Southington Police Department in Connecticut. Officer Fisher earned the “Hit of the Month” award for October when he deployed a single Stop Stick Kit and was able to successfully stop two stolen vehicles. By properly deploying the tire deflation device he was able to puncture three tires on one vehicle, which continued approximately one mile before the suspect bailed from the vehicle and was apprehended. With the same deployed Stop Stick Kit, Officer Fisher punctured two tires on the second vehicle, which continued for several miles until the suspect abandoned the vehicle and was apprehended by a K-9 unit. This was Officer Fisher's first time deploying a Stop Stick. “Officer Fisher was strategic about deploying his Stop Stick unit. He found a good position on area of the road where it would be hard for the suspects to maneuver. He made sure he could deploy the device safely,” added Lt. Keith Egan, also of the Southington Police Department. The apprehension of these suspects was a joint effort among the Southington Police Department, Wolcott Police and Connecticut State Police. "The Stop Stick deployment was a good team coordination with officers from all of departments actively involved in the pursuit," explained Officer Fisher. He emphasized that the deployment was successful because of all of the officers communicating well and working together. 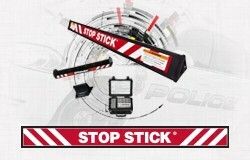 "We are delighted that Stop Stick was able to play this role in helping law enforcement officers in Connecticut protect the communities they serve and end this pursuit," Said Hugh Campbell, Stop Stick National Sales Manager. 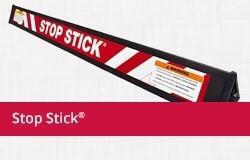 "To see Stop Stick perform effectively in stopping not one, but two vehicles, is an exciting testimony to the device's effectiveness in the field. We applaud the efforts of Officer Fisher and the other professionals involved in this pursuit." 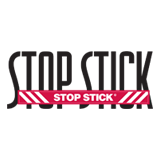 Each month, deployment reports are submitted to Stop Stick, Ltd. from dedicated law enforcement personnel. 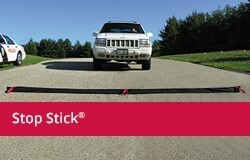 To date, Stop Stick has recorded almost 30,000 confirmed Stop Stick hits. All deploying officers receive a letter of accolade as well as a Stop Stick “Hit Pin” after successful use of the device. From those forms submitted each month a “Hit of the Month” is chosen for each of the four geographic regions of the country. These Hit of the Month recipients demonstrate excellence in deploying Stop Stick as they assist in protecting the public and apprehending suspects without loss of life or serious injury.